Adeptus Mechanicus, Imperial Knights, Astra Militarum and Thousand Sons: Tyranid Stratagems! 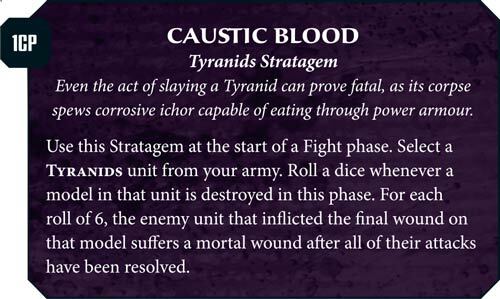 Today Warhammer Community posted a preview on Tyranids Stratagems. Cool! Holy Terra, a Swarmlord outsmarted Marneus Calgar during the Battle of Macragge? I did not know that. That's insane. Bloody buggers. They really are intent on bullying my poor Guardsmen, aren't they? Leave my Guardsmen alone, for Emperor's sake! Just look at that, my poor Guardsmen all holed up behind an Aegis Defence Line, outnumbered, surrounded and inevitably doomed. Freaking hell, there's only one Company Commander, a command squad and a single Veteran squad there against so many Tyranids! How is this fair!? Judge, my Tyranid opponent is cheating! The first Stratagem, Feeder Tendrils look really awesome. I like it! There's no downside to this Stratagem at all. Sure, 1/3 of the time you'll end up back to square one, spending a Command Point to gain another, but 2/3 of the times you'll be getting an extra Command Point or two! And there's no loss, since even if you roll a 1 or 2 for D3, you'll just refund the Command Point you've just spent. So spam it every single time you kill a Character in the Fight phase. It's also pretty doable. Huh? This doesn't seem very good if you ask me. Maybe it's just me, but honestly? 3 models? If you kill one model, the Zoanthrope squad is useless, and you can't use the Stratagem. And you've just invested a lot of points into something you can no longer pull off. You probably have to take them in units of 6 each just to mitigate the losses, and I doubt that's worth it. 3 of them is 120 points, and 9 of them are 360 points. Doubling them will bring them up to 720 points, which is a large chunk of your army. Well, it sounds good, but for 2 Command Points? Huh...then again, it might be too good if it's just 1 Command Point, especialy with all the dakka a Hive Tyrant can shoot. Not sure why they use Carnifex since Hive Tyrants have a much better ballistic skill than Carnifexes. And ideally you want your Carnifexes to be equipped for melee combat, not shooting. This is actually not bad for Gorgon Hive Fleets. Not only do they re-roll ones for wound rolls, they do additional damage for wound rolls of 5+. That is incredible. Now this is awesome. 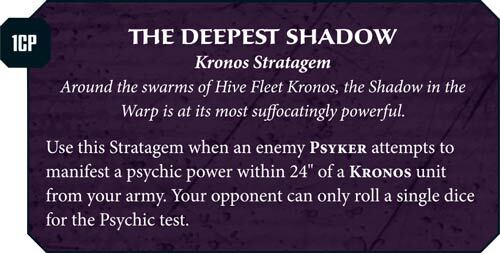 It makes me want to build a Kronos anti-psyker Tyranid swarm just to troll psyker-heavy armies. 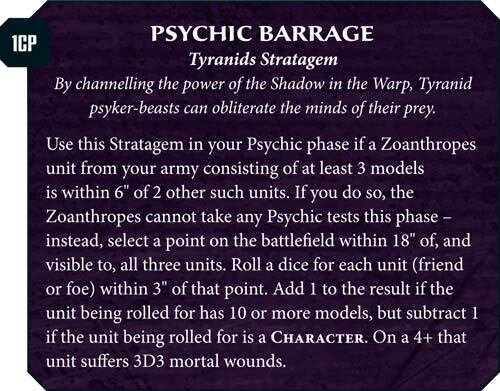 Combine this with Shadow of the Warp, and the Soul Hunger Warlord Trait, which basically forces psykers within 18" to deduct 1 from their psychic tests, and then use this Stratagem to force them to take the test with only one dice, and then Soul Hunger causes D3 mortal wounds when they fail that psychic test. HA HA HA HA HA HA HA! Move over, Culexus Assassin! You've nothing on Kronos on destroying psykers! Plus Exocrines and Tyranofexes that can re-roll ones (and the latter can shoot twice) when not moving? Sweet! Kronos is just too awesome! Caustic Blood also looks pretty good. 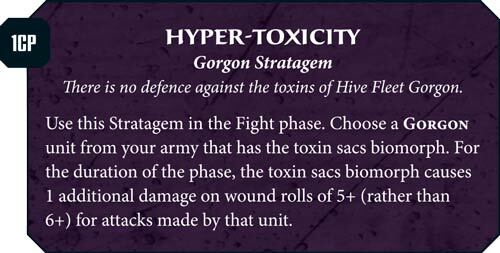 Especially if you swarm a big unit with your numerous cannon fodder and let them die - they will explode and spray their caustic blood all over them and cause a ton of mortal wounds. That's sweet! Ah, Warhammer Community erroroneously mentioned you can fill a Battalion Detachment for just 699 points. That is completely incorrect. I think they mean you can fill a Brigade Detachment for just 699 ponts since a Battalion Detachment costs only 300 points. Seems like we'll be looking at the units tomorrow, so stay tuned!